Cornucopia is a modern restaurant offering International cuisine. The average price of a main course dish at the Cornucopia restaurant is 15 euros. The average price of a 3-course meal at the Cornucopia restaurant is 25 euros. Note that although GoMadrid.com strives to maintain all information about Cornucopia up to date, the prices mentioned are only an indication and may not reflect the exact value of your meal. Cornucopia opened in 1992, and is run by Kim Manning, Fernando Bazán and Bernardo Martínez. It is a restaurant of creative cuisine, merging the traditions and ingredients of different countries. It offers a wide selection of courses in one of three dining rooms decorated with art exhibitions. Cornucopia is one of the few restaurants in Madrid to offer roast turkey for dinner on Thanksgiving Day, following the traditional American recipe. A menu in PDF format is available here. The restaurant offers an extensive wine list, also available in PDF format here. Cornucopia was recently adapted to facilitate mobility for disabled people. Special home-made pumpkin cake, apple-tart or bourbon-walnut cake. There is a fixed menu of the day which includes first course, main course, bread, dessert and a soft drink (vegetarian courses available on demand) - available from Monday to Saturday from 1:00 p.m. to 4:30 p.m. (except Bank Holidays). And also a fixed 'night menu' which includes: first course, main course, dessert and a soft drink (vegetarian courses available on demand) - available from Monday to Thursday (except Bank Holidays). Open 7 days a week continuously from 12:00 a.m. to 00:00 a.m. 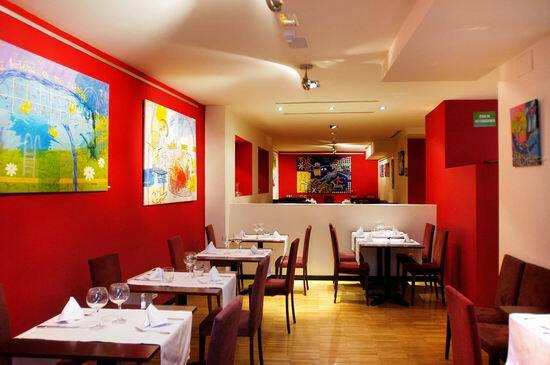 The address of the Cornucopia restaurant is: Calle Navas de Tolosa, 9, 28013 Madrid. The nearest Metro station is Callao. Please see the Cornucopia restaurant location map below.